The lack of fat insures that Buffalo meat will cook faster. Fat acts as an insulator – the heat must first penetrate this insulation before the cooking process begins. Marbling (fat within the muscle) aids in slowing down the cooking process. Since Buffalo meat lacks marbling, the meat has a tendency to cook more rapidly. Caution must be taken to ensure that you Do Not Over Cook Buffalo. When oven broiling, move your broiler rack away from the heat about a notch lower from where you normally broil your beef steaks. Expect your buffalo steaks to cook 1/3 faster than normal. Buffalo steaks are best when cooked rare to medium rare. It is not recommended to cook Buffalo meat past medium. If you normally cook your roast beef at 325 F, turn your temperature down to around 275 F for Buffalo. Plan on the roast being done in about the same amount of time as with a comparable size beef roast. To insure the temperature you prefer, we recommend using a meat thermometer indicating the internal temperature. Again, rare to medium rare is recommended. Looking for an easy way to prepare a tender, mouth watering roast… try this. Take your frozen roast out in the morning and place into a slow cooker (crock pot), add the contents of one dried onion soup packet with three cups of water. Turn crock pot to low setting and leave simmer for 9-10 hours, turning over occasionally. Remove and serve. Use the both for making gravy or simply pour a little over the meat. Ground Buffalo is also leaner (ranging from 90-95% lean). It will also cook faster so precautions must be taken to not dry out the meat by over cooking it. There is very little shrinkage with Buffalo burger – what you put in the pan raw will be very close to the same amount after you cook it. Pre-formed patties tend to dry out just a little faster when grilling. (Hint: the thicker the patty, the juicier the burger). Medium-rare to medium is best. Although ground Buffalo is leaner, there is no need to add fat to keep it from sticking to the pan or falling apart. Buffalo breakfast sausage is best cooked by using a frying pan at medium heat. First brown the sausage and add ¼ cup of water to the pan turning sausage occasionally. Continue to cook until water has boiled away and then serve. Looking for a quick and delicious way to prepare your Buffalo smokies… try this. Take frozen smokies and place into boiling pot of water, cook for approximately 5 minutes. Remove smokies from pot, cut diagonally into bite size pieces and sear in frying pan until lightly browned. Serve and enjoy. All Buffalo meat, no matter the leanness, has enough available fat in it to allow it to cook properly. the burgers don’t shrink, and it’s healthy and tastes great! This entry was posted in Cooking / Recipes and tagged bison vs. beef, cooking bison, cooking buffalo, recipes, tips for cooking bison on April 21, 2013 by Neil Hochstein. 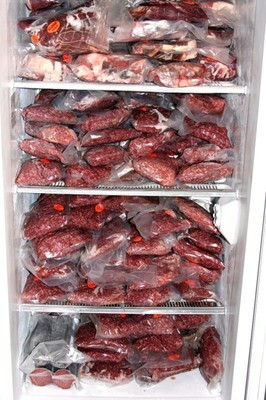 On average, a whole bison that weighs about 400 pounds will take up 8 cubic feet, or 0.227 cubic meters of freezer space.